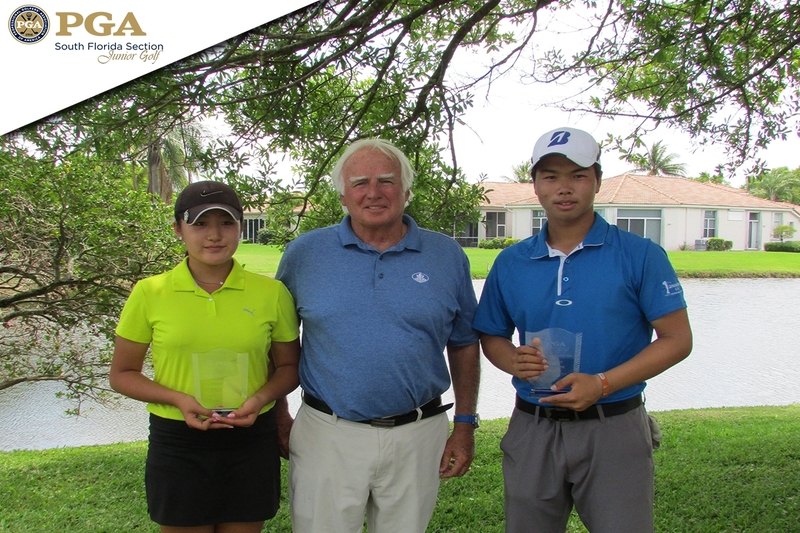 April 28th 2018 - ATLANTIS, Fla. – This weekend, the South Florida PGA Junior Championship Tour presented by The Honda Classic held Championship Tour Event #4 at Indian Spring Country Club on the West Course in Boynton Beach, FL. The weekend provided perfect weather conditions for the juniors. Atsuya Oishi of Port St. Lucie is new to the South Florida PGA in 2018. After only four events, the youngster has found his way to the winners circle. Oishi opened up round one with a two-under par 69 to take the early lead in the boy’s division. Oishi fired a final round 73 to capture the overall boy’s title by four strokes. Nicholas Estrada of Lake Worth, FL took home the boy’s 13-15 age division, while Stuart, FL native Chase Sholze captured the boy’s 16-18 age division. Skylee Shin of Doral, FL has multiple wins on the Challenge Tour, but is still searching for her first Championship Tour victory. Shin has finished in the top 5 in the first three Championship Tour Events of 2018 but has yet to claim the top spot. That all changed this weekend as Shin captured the overall girl’s title after back to back rounds of even-par 71. Amelie Alcantara of Plantation, FL took home the girl’s 13-15 age division, while Laura Lou of Miramar, FL took home the girl’s 16-18 age division. The South Florida PGA Junior Tour is proudly presented by The Honda Classic and supported by Don Law Golf Academy, Junior.Golf, The Boca Raton Regional Hospital Championship, Precision Pro Golf, Florida Institute of Performance, Florida Gulf Coast University, Palm Beach County Sports Commission, Pukka, The Men’s Fun Group at Mirasol, and Titleist.